The Salvation Army Meadowlands presents a blend of worship that has something for people of all ages including children. Each week in the service the children are called to the front where one of a team of selected adults does a 2 to 5 minute lesson just for them. The messages are simple and often involve objects or stories as Biblical truths are shared with our youngest church members. These children’s times are also appreciated by the older members of the congregation as the messages while simplistic for children are universal plus the actions and answers of the children, some called for and some unexpected, can be a real blessing. After a prayer the children and youth up to age 16 are invited to leave the service and go to Sunday School, a time of Worship geared just for them. For those children ages 0 to 4 Sunday school is in the nursery and consists of being involved in the Little Lambs Program. In Little Lambs the children, led by Ellie Millar and helpers, enter into worship through singing, prayer creative movement, arts and crafts and story times. The children/youth from 5 to 16 go to the gym where they share in a 15 to 20 minute time of open worship where action choruses and rhythmic praise songs, object lessons, games and activities are used to present Biblical truths. “Acting” YPSM’s Aimee and John Thomas have been known to go way outside the box to keep the children’s attention and drive home the scriptural message. In addition to the worship the younger children gain from the experience of being with the older children/youth they look up to and the older children/youth get to be role models. After the open portion of Sunday school the children/youth go to age specific classes. The children ages 5 and 6 go to the familiar surroundings of the nursery where they have an area dedicated just for them. This class uses lessons from Scripture Press geared specifically for them. Teachers Brookelyn Millar and Nygel Washington Purser make this class interesting by the dramatic way they present the Bible stories, lead conversations to build relationships and assist with the work books and take home crafts. The children ages 7 to 11 go to the Ready To Serve Class. Here through the use of a Salvation Army video series they are led by Ready To Serve Squad leaders Kyle Millar and Aimee Thomas on a weekly adventure. 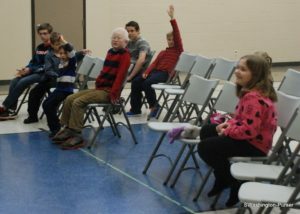 They participate with the onscreen Ready To Serve team to complete assignments, solve mysteries and learn lessons about the Bible and The Salvation Army. The 12 to 16 year olds remain in the gym with Myles Washington Purser and Aimee Thomas where through the aid of Scripture Press material for Young teens they learn more in depth truths from the Bible and how this relates to them as they grow in their Christianity in the challenging lifestyle of the 21st century. The Meadowlands Youth Group is a fun and friendly group of teenagers and young adults aged 13 to 25. The group meets twice a month from September to June in an accepting and open environment where youth are free to be themselves and join in fellowship together. Past activities have included sleepovers, paintball, car rallies and various game nights. Bible study and prayer time is an important part of our program and young people are encouraged to bring their bibles, pray and express their thoughts and feelings in a safe setting. For more information on upcoming events please contact Kyle Millar at kyle_millar@hotmail.ca or Brookelyn Millar at brookelyn_heintzman@gmail.com. Meadowlarks is the Meadowlands Children’s Choir and is made up of girls and boys who attend church and want to sing songs and have some fun!! The songs we sing are both fast and slow…some will have you tapping your toes and some will just put a smile on your face. We like to sing songs so we can tell other people stories about Jesus. While we are learning the songs at practices, there’s always something to laugh about. No matter where we are located we hope to always spread our message and be a vital part of the Meadowlands Corps ministry. The YP Band is a place where young people from the ages of 8 to 18 can learn music in a brass band setting. The band performs at various times throughout the year assisting worship in the Sunday morning service as well as at nursing homes and other venues in the community. The members of the band enjoy the opportunity to improve their musical skills while they receive encouragement and positive reinforcement during their teen years. 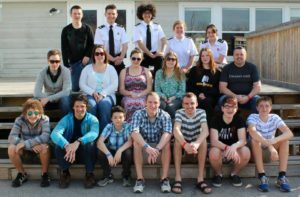 One of the most important aspects of the YP Band is the opportunity to have social interaction with their peers in a Christian environment and if they wish, the YP Band is an excellent way for the older teens to prepare for entry into the Senior Band. Christian fun, fellowship, and music making are what make the YP Band so important to the young people and families involved, and to the church. The YP Band meets for practice on Thursdays from 6:45 – 7:45 p.m. from September to June under the leadership of Brad Cox. Please contact Brad Cox at coxbradleyjohn@gmail.com for more information.